Meet Lidia the Seal. She stands as tall as I can reach, in a vacant lot in Bandon, Oregon, the creation of artists and volunteers of the Washed Ashore Project. 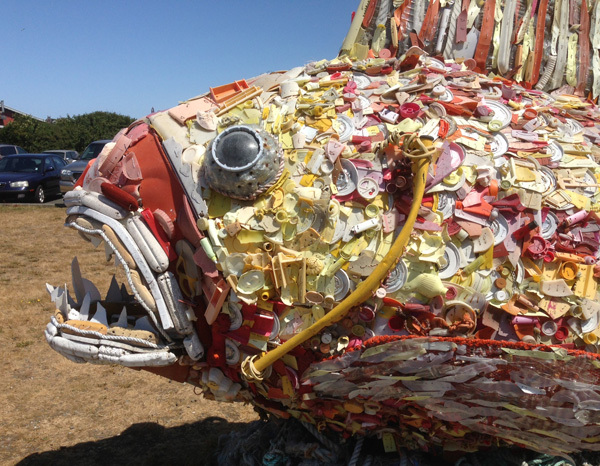 The group’s goal is to turn plastic and other ocean garbage into art that illustrates the harm to marine life and the entire food chain resulting from careless dumping. 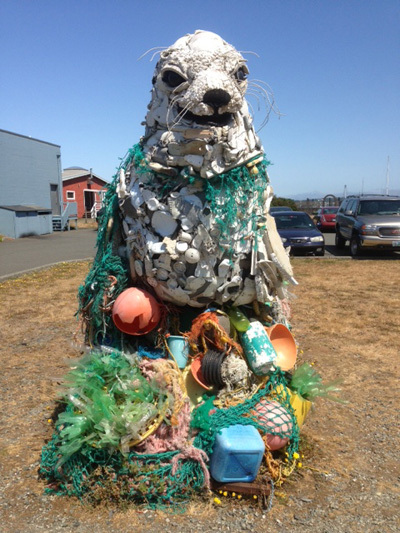 So far, 1000 volunteers have collected three and a half tons of marine debris along 20 miles of coastline and used it to create 18 giant sculptures. Plaques beside the sculptures explain a little about the dangers of the degrading petrochemicals in plastics in the ocean, as well as the process of collecting, washing, sorting, and recycling what the volunteers collect. I wish you could have been there to share the delight of rounding a corner to find Lidia and Henry, but for the next best thing, please visit the project website: washedashore.org. There are many more photos and descriptions illustrating the process of turning these castoff items into art, as well as information on exhibits in other locations. Maybe one day soon, one of these washed ashore creatures will visit a spot near you! Meanwhile, enjoy these, and perhaps, as one of the plaques says, you will be moved to see art where others see garbage, right where you are today! This entry was posted in Animals, art, Photography, Science and tagged 2013, Animals, art, Environment, Events, marine life, photography, Science, Washed Ashore Project. Bookmark the permalink. I hadn’t seen anything about this prior to your post. This is terrific. What a great teaching tool. Thanks for the post, the link, and the photos. I love to find things like this and be able to pass them on!